Cyclone season has come early to the Pacific Islands - in political terms at least. Two countries have emerged with new leaders, and leaders in three other nations are under threat. In Vanuatu, as soon as prime minister Edward Natapei departed for the Cancun climate change conference in Mexico, his deputy, Sato Kilman, plotted a coup to replace him. Details of the vote in parliament to dislodge Mr Natapei remain blurred, because the plotters barred access to the public and the media. The Speaker who imposed the bar, George Wells, was rewarded with the Foreign Ministry. 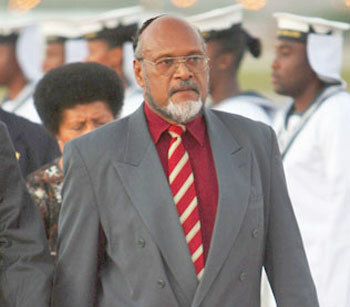 Mr Kilman (right) swiftly moved to reconcile with Fiji's military ruler, Frank Bainimarama. 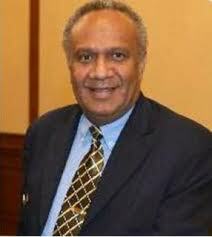 Mr Natapei had refused to endorse Commodore Bainimarama as his successor as chairman of the Melanesian Spearhead Group. But Mr Kilman will fly this week to an MSG meeting in Solomon Islands, where it is expected Fiji will be endorsed as chair of the grouping that also includes Papua New Guinea. In Samoa, police are investigating threats to kill veteran Prime Minister Tuilaepa Sailele (below) and Chief Justice Patu Falefatu Sapolu. The police believe the threats are related to the assassination 11 years ago of then works minister Luagalau Levaula Kamu, who was shot while speaking at a function in the capital, Apia. 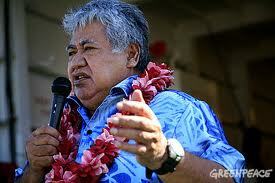 Two other members of Mr Tuilaepa's then cabinet and the son of one of them were jailed for life for that assassination. One of the three died in jail and the other two - former minister Leafa Vitale and his son, Alatise - were released on parole earlier this year. In PNG, Prime Minister Michael Somare said he would step aside if the Chief Justice were to appoint a leadership tribunal to hear charges relating to his failure to submit details of his assets and business dealings, as required by the leadership code, since 1995. In Fiji, Reserve Bank governor Sada Reddy has resigned after 35 years with the bank, halfway into his first three-year term in office - for reasons not yet made public. The military government cancelled last Friday's annual Coalition of Human Rights march in Suva - citing a warning from the US embassy that "these marches may have an anti-government tone, and it is possible that assembled groups may become unruly". Fiji government spokeswoman Sharon Smith-Johns said the embassy had "chosen to take heed of gossip and rumour rather than confirm the facts with the Fiji government". The government also attacked the US for refusing to provide Chief Justice Anthony Gates with a visa to attend an International Criminal Court meeting at the UN in New York, and for refusing visas to a government delegation to transit through the US to the Cancun conference. In Tonga, which last month held the first election for a parliament that commoners would control, it is increasingly likely that an aristocrat will nevertheless be elected as the new prime minister on Friday. And in Solomon Islands, the slim parliamentary majority of the government led by Danny Philip, formed since the August election, has become shaky following the jailing last month of then fisheries minister Jimmy "Rasta" Lusibaea. Viti should offer Tonga a deal in their search for an aristocrat to head their new goverment - give us a pig - we'll give you Nailatikau. Bring back Peter Foster ! And Fiji has Aiyaz Sayed Khaiyum ! Looks like Frank's coup disease has now spread to the other Pacific Islands. To the people in Samoa , Solomons and Vanuatu, I urge you to look closely at the result that is now evident in Fiji , where we have gone backwards 40 years in all areas of life and that is where you are heading. So deal with it now before it's too late. Democracy is not perfect but it's the best solution available. Oilei!! Fiji should just militarily takeover Samoa and Tonga and claim it as our own territory! Fire qa! that the embassy had "chosen to take heed of gossip and rumour than confirm the facts with the Fiji government." 01. With all the lies emanating from the Illegal Regime, day in day out - what do you expect? 02. The INTEL of the US is far far more superior than your Government's INTEL. In fact the US INTEL is the BEST in the world 24/7!! You dumb nitwit!! 03. You and your masters seem to have this misconstrued and dumb interpretation that just because the people[s] of this country are saying that they support the cause, they are in reality NOT. They have smartly realised that because you people are so dumb, they cam make you think that they do support you - why / To get what they want from you. Get it you foreigner? The itaukei are smarter than you think. I can go on and on, for your benefit, but your limitation and capacity to NOT absorb and see the reality of things prevents me from doing so. If Fiji Water is any indication of Viti's ability to handle such blessing - lets hope your wrong? fiji has oil & gas.but investors will come .when fiji has good govt.we have too many liumuri chiefs now.all have personal agenda. .saying goes on age piche cant beat the fijian liumuri.